This is a modern, contemporary apartment, nicely decorated and in excellent condition. 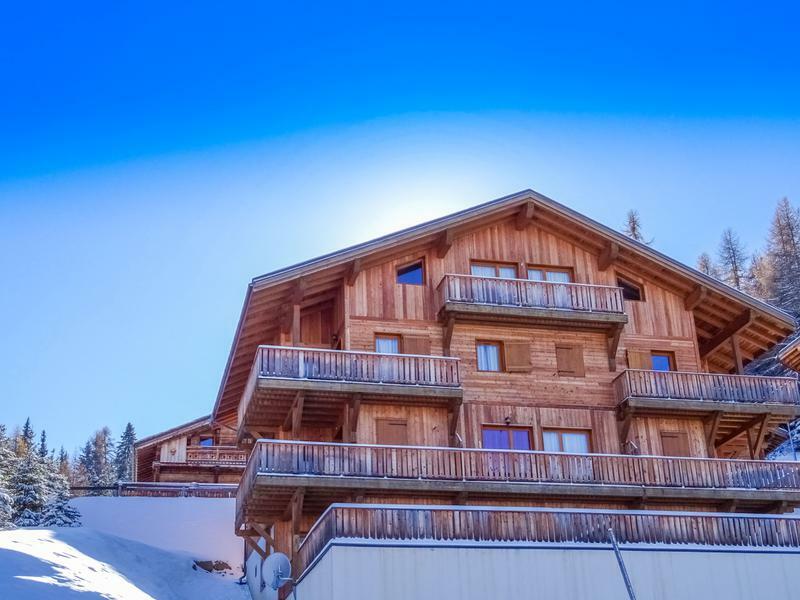 A value for money ski base for a family with excellent rental potential and a local firm on hand to manage rentals La Plagne is one of France's great ski resorts and the Vanoise Express link to Les Arcs has created Paradiski; with 425 km. of piste ,of which 70% is above 2,000m, this is one of the world's great ski areas. Entering the apartment there is a spacious hallway with built in storage space and an entry phone system. There are two bedrooms. The larger of these is a double/ twin with built in wardrobes and two windows. The second bedroom is also a twin/double; it is currently equipped with a set of bunk beds and and has the one window. A family sized bathroom has a bath with overhead shower, washbasin and heated towel rail. It is nicely decorated in a modern style with mainly white tiles to the walls and beige tiles on the floor. There is a separate WC. The living area, just under 20 sq.m, is open plan and is equipped with a double sofa bed and TV/DVD. The dining table has 6 chairs. The kitchen is fitted with Mobalpa units and has a built in full sized oven, 4 ring ceramic hob, dishwasher and fridge with freezer. There are two doors from the living area to the L shaped balcony; this offers a good outside space (think barbecue!) 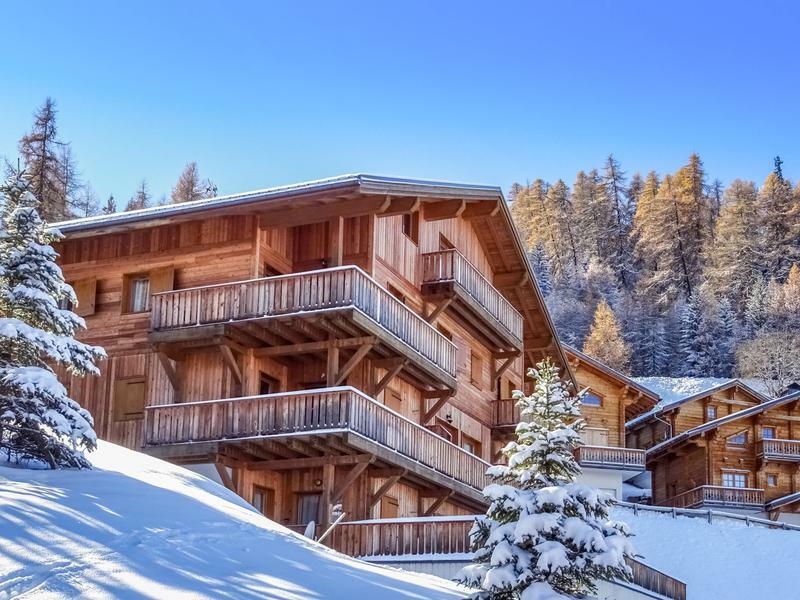 with room for socialising and offers spectacular views over the valley to Mont Blanc. Throughout the apartment good quality laminate flooring and a nice use of wood on the walls enhances the chalet ambiance Crete Cote Village is a small-scale development of individual chalets and apartments. 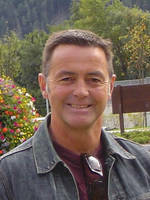 The village offers spectacular views and the piste down to the La Roche chairlift runs close by--perhaps 200m away. It is just a couple of minutes by the free shuttle bus to Plagne 1800 which has two chairlifts and a choice of shops , bars and restaurants; Plagne Centre is just another couple of minutes further on. 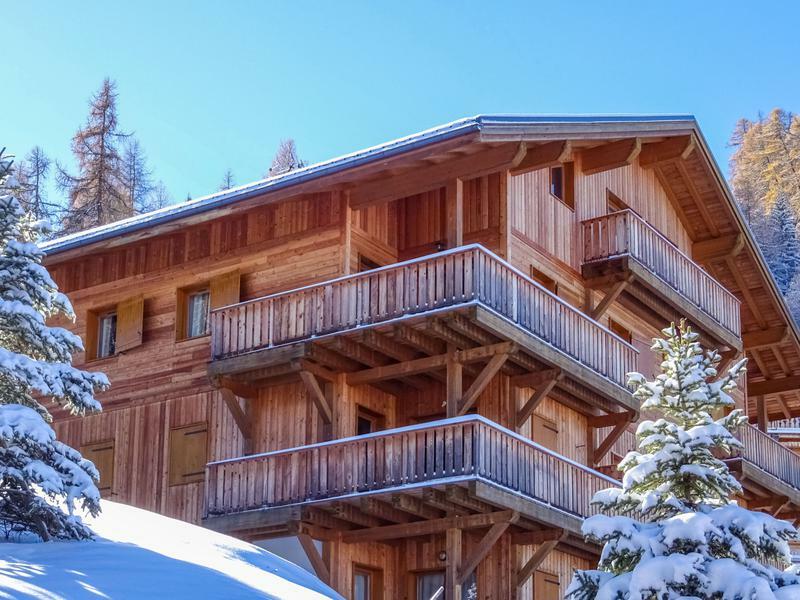 Alternatively the bus runs down to the La Roche chairlift with a ski shop and lift pass office and the excellent Chalet de la Roche restaurant with its large outside terrace. La Plagne is one of France’s best-known ski resorts with 225 km of piste offering something for all levels of skier and boarder. There are lovely cruising runs through the trees to villages such as Montalbert and Montchavin, a huge choice of high altitude slopes, snow-parks and some great off piste . The amazing Vanoise Express cable car link to Les Arcs has created PARADISKI, one of the world’s largest ski area with some 425km of piste.. Just below Crete Cote Village is the Olympic Bobsleigh run which is open to the public; an exhilarating run down France’s only bobsleigh run. Although better known as a winter resort La Plagne has a lively summer season with a host of activities on offer and lifts open to allow you to access the higher peaks. .
Travel Info. By Air; the nearest airports are Chambery, Geneva, Grenoble and Lyon. By Rail; the nearest station is the valley town of Aime some 25 minutes away by car/taxi. In winter a direct Eurostar service runs to Aime. Self-drive; it is an approx 10 hour drive from the main channel ports.